Every morning I wake up and watch life and death outside my bedroom window. We have two beehives perched on the roof of a first floor sunroom. As I watch the hive come alive with the morning sun, the bees begin their very full workday, zipping in and out, hovering in spirals as they await return entry. There’s something deeply enlivening about the practice of keeping honeybees. They are infinitely purposeful and coordinated. Their intelligence resides at the level of the whole, not the individual. Their behavior responds and adapts to constant changes in their environment. 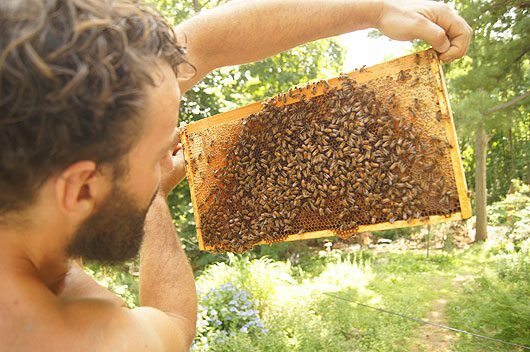 If we want to learn about community resilience, we couldn’t do much better than study beehives. Better still, we get to steal their honey.